I already had a Timbuk2 messenger bag. I had treated that bag terribly and it was still standing, so I was all but certain that I would simply get whatever backpack version of that bag existed when I needed a backpack. As it happened, Timbuk2's offering was lacking, and after researching the other brands I knew of, (Brenthaven, Tumi, Dakine, InCase, Briggs & Riley, Samsonite, High Sierra, etc.) I simply could not satisfy the things that weren't up for compromise in a backpack. 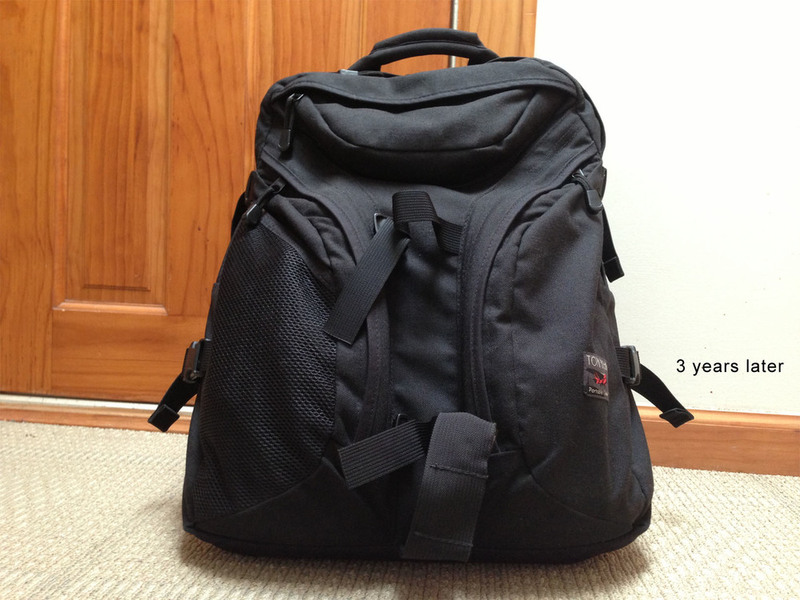 I wanted a black backpack, with simple smart design, that was huge, and oh yes… durable. It had to be able to withstand three years of law school. I'd heard that a Constitutional law book alone could do in a backpack, and I refused to be the person wearing a backpack and dragging a suitcase filled with books through the halls of academia and elsewhere. In case you think this just conjecture or wild exaggeration, as it happened one of my best mates in law school had his backpack torn a sunder (likely by a dreaded con-law textbook) leaving his concealments for all the world to see on the hallway floor 1L year. That could have been me. Tom Bihn's Brain Bag entered the picture right at the tail end of my research, as I was on the brink of compromising one or more of my initial requirements (color, simplicity, size, and durability). It immediately addressed the issue of size/volume according to its specifications, which had been especially difficult to satisfy. According to the specs, the Brain Bag was size adjustable using the side straps that could be taken in or let out to increase its interior volume and keep it looking great when not filled. Up until that point, it was as if other backpack manufacturers decided to place back-straps on fanny-packs and pass them off as backpacks. One hurdle for the Brain Bag was that I'd never heard of the name Tom Bihn until I started doing research. Nonetheless, it quickly struck me as a solid brand. A huge positive for the Brain Bag was that United States Service men and women used the bag while on tour. That at least seemed to be enough initial evidence to satisfy the durability requirement. In the same vain, I also liked that it was made in the United States. Simply not enough products are made in the U.S. even when manufacturing components and other costs are not prohibitive. After, perusing the web for further information, I found overwhelmingly positive feedback for the backpack. What I could not find, was anyone besides Tom Bihn selling the Brain Bag. Not one retail outlet selling the bag, at least at the time, and no previous purchasers were reselling. This struck me as odd in a good way. Typically, one can always find a product being sold by someone other than the manufacturer. Well, not this time, not even on craigslist. I took it as a very positive sign that no consumers were reselling the product. In addition to the aforementioned attributes, the Brain Bag was beautiful in its simplicity. Also, if you desired a black Brain Bag, you could purchase a solid black Brain Bag with no stinking accent color, or shiny material in some small section, or other ridiculous "design detail". So far I have told you about the immediately measurable attributes of the Brain Bag such as size/volume, simplicity in design and the ability to get a straight black colored Brain Bag. However, the durability element had really been speculation based on reviews I read on the internet, and based on supposed typical use of the backpack. After over three years of being put through-the-ringer, I can confidently say that the durability of the Brain bag is superb. It has survived LSAT prep, numerous trips (usually the only thing I take when I travel), and most importantly 3 years of law school. It has withstood the attempted destruction of con-law textbooks and saved me the ire of being the full-blown-travel-luggage toting law student. I highly recommend the Brain Bag. I cannot overstate that it is simple, beautiful, classic and rock solid. Quickly, I also purchased Tom Bihn's Brain Cell laptop pouch that snaps in and out of the Brain bag to protect my 15 inch MacBook Pro. The Brain Cell comes sized to a particular laptop for perfect fit. It is also a fine product and it too has more than survived law school in all its madness. In fact, my MacBook pro was absolutely fine after a certain female law student's psychosis led her to jump atop my Brain Bag which was stuffed with books and my MBP tucked in the Brain Cell. If you need laptop protection and are considering the Brain Bag, also consider the Brain Cell. Tom Bihn has updated the Brain Bag since my purchase, to include a clip in the front for attaching additional items such as a water bottle. A very nice addition. Here are some pics below. Apologies for the first set, my pics (these from iPhone 3G) are always only as good as my current cell phone allows since I rarely use a digital camera.